Add a Word FRENZY Deluxe set for only $15.00. Add Coin Game Game Packs for only $3.00. Legend says, in ages past, there was a kingdom of such wealth and knowledge the world had never seen nor will see again. In this kingdom a game of pure skill was played. So prized was this game, it was played with the finest gems and was guarded as the kingdom’s treasure. The kingdom was Atlantis. The game is Triad™. TRIAD™ – Triple Challenge Strategy Game exudes wealth and intrigue. From it's rich leather looking packaging tube to it's beautiful glass playing pieces and mythical art premium game mat design, Triad is visually stunning. But, Triad doesn't stop at the stunning packaging and components. It is a game of pure skill with limitless strategic depth and brilliantly simple game play. TRIAD takes only minutes to learn and less then a half hour to complete. Unlike most games of skill, with their tortoise like pace, TRIAD is fast moving and full of game changing surprises and unexpected conclusions. The simplistic play combined with the goal to be the first to achieve any one of three unique and distinctly different outcomes creates quick, addictive game play. These challenging strategies can be played separately, simultaneously, or as a multi-game tournament. TRIAD is a game of unparalleled variety. Play once and you will be a fanatic for a lifetime. For 2 players ages 8 and up. If you would like to read an overview of how to play TRIAD, CLICK HERE. 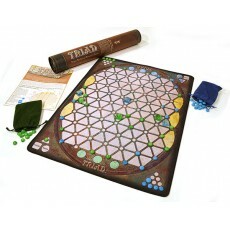 TRIAD - Triple Challenge Strategy Game includes beautiful components that inspire play. Huge full color, rubber-backed, water-resistant Premium Game Mat with hemmed edge. 100 glass gem playing pieces. 6 large glass jewel playing pieces. 2 Velvetine draw string game piece pouches. For 2 players, ages 8 and up. "Bought this game on a lark, knowing nothing about it. The game is simply brilliant. Many things to think about each turn. Buy it, try it, this game is awesome." Word Frenzy is a combination of Scrabble and Ultimate Fighting. And I have the scars to prove it! No other educational game comes close. My kids love it! We love Word Frenzy. It’s a 10+ on the fun meter! Word Frenzy is a GREAT family game that has bridged the generational gap in our family game nights. FCG Deals Newsletter gives deals, discounts, news and tips. Use the Product Inquiry form below to let us know.